In 2006, Norah Norton was told by her doctor that within two years she would have to sell her house in the Cork countryside and move into the city. Norah suffers from Age Related Macular Degeneration (AMD) which, if left untreated, would affect her vision to such a degree that she wouldn’t have been able to drive. Through lucky happenstance, Norah learned about Prof John Nolan and the Macular Pigment Research Group (MPRG) at Waterford Institute of Technology, a research team who are conducting ground breaking clinical trials examining the role of nutritional supplements in visual performance and the prevention of Age Related Macular Degeneration (AMD), a condition which can lead to blindness. AMD is the leading cause of irreversible blindness in Ireland, affecting over 86,000 people and costing the state up to €133 million per annum. The number of AMD sufferers will continue to increase because of the growing and ageing population. To view the Nationwide programme which featured Norah, click here. MPRG are conducting a number of clinical trials into the role of nutrition on vision and the prevention of blindness in their research centre in Waterford. Anyone interested in participating in their trials should contact the research group on 051 845505 or by emailing the team at [email protected]. More information on the MPRG and its research can be found on www.wit.ie/mprg. 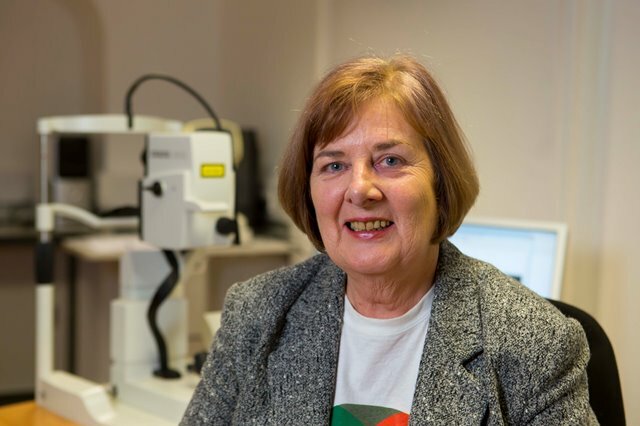 The mission of the Macular Pigment Research Group is to study the role of eye nutrition for vision and prevention of blindness and the focus of the research concerns prevention of age-related macular degeneration (AMD). The MPRG currently employs nine full-time researchers and is a multi-disciplinary team comprising vision scientists, nutritionists, biochemists, statisticians, optometrists, and ophthalmologists. This research facility, based on WIT’s Carriganore campus, offers state-of-the-art vision testing laboratories and infrastructure and is the only one of its kind in the world. The MPRG Principal Investigator, Professor John Nolan, has been researching the role of nutrition for vision for over a decade. His significant contribution to this area of research is reflected in his Fulbright Scholarship and European Research Council and Howard Foundation Fellowships. Professor Stephen Beatty, Consultant Ophthalmologist and Director of the MPRG, is one of the world’s leading eye specialists. The group has significantly contributed to science and medicine by publishing landmark research papers in high impact eye journals. The MPRG has published more scientific papers on this topic than any other research group in the world. In July 2011, Prof John Nolan and the MPRG were awarded €1,493,342 by the European Research Council (ERC) for their project entitled “CREST (Central Retinal Enrichment Supplementation Trials): Macular Pigment and its impact on vision and blindness”. This ground-breaking study will advance understanding of the protective role of macular pigment, and potentially improve normal vision and prevent or delay blindness due to AMD. Set up in 2007 by the European Union, the European Research Council (ERC) aims to stimulate scientific excellence in Europe by encouraging competition for funding between the very best, creative researchers of any nationality and age from anywhere in the world.